After an earthquake hit the region on 26 October 2015, the government of Pakistan failed to provide the people of Gilgit Baltistan with aid to recover, particularly as harsh winter conditions set in. People of Gilgit Baltistan have been badly hit by the harsh winters. With no government help, especially after the October 26 earthquake, the residents brace up for the extreme weather conditions. A children’s group, sitting in the open over the snow, is enjoying eating snacks. 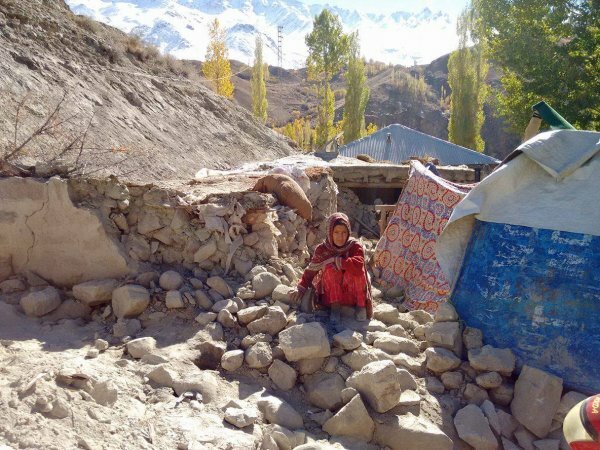 It is for the first time an NGO- Alamgir Welfare Trust International has reached the far-flung district of Ghizer in Gilgit Baltistan after the October 26 earthquake, distributing food packs and blankets. However, the woes of the locals will not end with this little relief measure – the food packets will not last long and blankets will not help them to face the chill in the harsh climatic conditions that have engulfed the region. Prime Minister Nawaz Sharif had, after the earthquake, announced a relief package for Gilgit-Baltistan- Rs 0.2 million for completely damaged houses, while Rs 0.1 million for the partially damaged. Till now, the locals have received 2 Kgs of rice, 2 Kgs of pulses and I Kg wheat – a slap on their face. While the people living in the mountainous regions do not have any option to get their voice heard, the students studying in urban localities have been on protest, demanding compensation for the losses people suffered. For them, the Pakistani government.